Of all the jobs to be done around the house, hoovering is far from likely to be anyone’s favourite (if it’s yours, get in touch, our carpets haven’t been done for a while). Some manufacturers have attempted to ease the pain with wireless models, maneuverable balls, and all manner of attachments and detachments, yet it still leaves us cold. So what’s the alternative? Well, thanks to clever clogs engineers, you can now pass on the responsibility to a friendly dirt-sucking robot. Banish thoughts of robot maids with friendly faces and feather dusters, The Jetsons it ain’t – but it’s still blooming clever. From relentless innovators Dyson and Samsung to other household names like Hoover, Vileda and Miele, everyone’s trying their hand at autonomous cleaning, all with impressive results. How do you pick the best one? There are a number of functions to look out for when searching for the best robot hoover. First of all, ‘virtual walls’ are something you’ll see mentioned time and time again: these are little devices you can dot around your home to mark off areas that don’t need cleaning, so that the robot cleaner knows to steer clear, and most mid- to upper-range models come equipped with them. Then, there are the concerns you’d have with any cordless hoover, battery life and capacity – i.e. how long can it go for, and how soon will I need to empty it? Then there are the smart hoovers – if the idea of an automatic hoover wasn’t enough, prepare to have your mind blown – Wi-Fi enabled for scheduling cleans while you’re out, or receiving stats on area covered and cleaning managed. Some are even voice-enabled for use with Amazon’s Alexa or Google Assistant. Whether you’re a gadget fiend in the market for the smartest vacuum, or just want a budget model to try, you’re in good hands. Read on for our pick of the best. If you would rather be in control of your vacuuming, check out our round-up of the best vacuums. The Dyson 360 eye has an all-round brush bar for picking up dirt with every pass, and its Dyson V2 motor offers powerful suction on hard and soft surfaces alike, giving it our top spot for best cleaner. It deals well with obstacles, and while its taller profile might put some buyers off, it’s slim enough to get to where it needs to be. This smart hoover also supports Amazon’s Alexa for voice control, and has a companion app for scheduling cleans. It comes at a price, yes, but at time of writing, it’s the most effective robot vacuum cleaner on the market. The original Roomba from iRobot automatically adjusts to changes of surface, dodges clutter, and deals admirably with wall edges, skirting boards and corners. Plus, when it’s done, it trundles itself back to its base to recharge. It even senses whether it needs more juice mid-clean, and will happily recharge and carry on until the job’s done, so you can leave it to its own devices while you pop out. Set it going with the touch of a button, or schedule a clean with the app. Smart, simple, and low-maintenance. If the Dyson is in your price range, but you want more battery for your buck, go for this one. The Neato Botvac offers a huge amount of control for trickily configured houses and ad hoc cleaning. 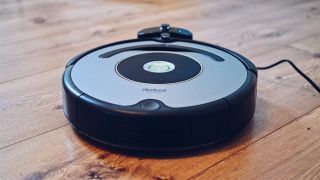 It maps your floors for methodical cleaning rather than rambling randomly across the room, and its CornerClever tech means it knows to get close to walls and deep into corners for a thorough clean. Its accompanying app is the best we’ve seen, and, like the Dyson, you can link up with Alexa to give voice commands, but it has the added bonus of working with Google Assistant. Neato! This techy offering from Samsung covers all surfaces quickly and efficiently, using its clever Point Cleaning controller to select the dustiest spots. Like the AirCraft Pilot Max, above, it’s exceptionally good at picking up tricky pet hair, but with the added value of consistently powerful suction, a wider brush for cleaning larger areas in one pass, and superior navigational skills. If you can justify the extra £600, it’s a ruthlessly effective and hassle-free way to vacuum. If not, the Neato Botvac is a worthy rival. This great value AirCraft model is the best robotic vacuum cleaner for pet-owners, handling dog and cat hair quite happily, as well as filtering out allergens with its HEPA filter. It’s not as programmable as the iRobot Roomba, but its Daily Scheduler is really the only mode you need, and is easy to set up. It’s also not as suction-heavy as higher-priced models, and rather than map the cleaning area it tends to bumble around aimlessly while it does its thing – but for the bargain price, this is understandable. For households with pets, people with allergies, or anyone on a budget, it’s a smart buy. With stair sensors and an intelligent navigation system, this Vileda vacuum cleaner is a surprisingly feature-packed entry level model for robot vacuum newbies. It’s self-charging and gets the job done across hard floors and short-pile carpets. The only thing that really lets on to its budget price is its lack of virtual walls, meaning you can’t mark off areas not to be cleaned. If this is a deal-breaker, consider the equally pocket-friendly AirCraft Pilot Max. This Hoover robot vacuum has an impressive 9 cleaning modes, so for users looking to streamline their collection of appliances, or who don’t want to shell out more on top for a manual vacuum cleaner, it’s an ideal purchase. It deals well with all floor types, with the thoughtful inclusion of polishing pads for wooden and delicate flooring, and its voice guidance makes it very simple to use. If you don’t know which model to go for, this is a sure bet, a great mid-priced all-rounder with some nice features. Miele’s famous promise that they test for the equivalent of 20 years’ use is evident in this accomplished robot vacuum cleaner. A discernibly high-quality bit of kit, it boasts a Triple Cleaning system with two rotating side brushes, a beater bar, and a fan to pick up all types of dirt; a long runtime and high capacity; and advanced corner and edge cleaning. It’s also gentle while navigating around furniture, meaning no bumps and scrapes. The only downside is it’s not great on pet hair, so for the most effective clean in houses with animals, go for the Samsung PowerBot.